NASA's Kepler space telescope has found eight alien planets in the "Goldilocks zone"--that is, they orbit their stars at just the right distance to have liquid water, and maybe life. Two of the newfound planets, dubbed Kepler-438b and Kepler-442b, are being called the most Earth-like exoplanets ever found. Both planets orbit red dwarf stars, which are slightly cooler and smaller than our sun. "We don't know for sure whether any of the planets in our sample are truly habitable," Dr. David Kipping, an astronomer at the Harvard-Smithsonian Center for Astrophysics (CfA) and one of the scientists involved in the discovery, said in a written statement. "All we can say is that they're promising candidates." Illustrations of the newfound planets pictured next to Earth. Click to enlarge. 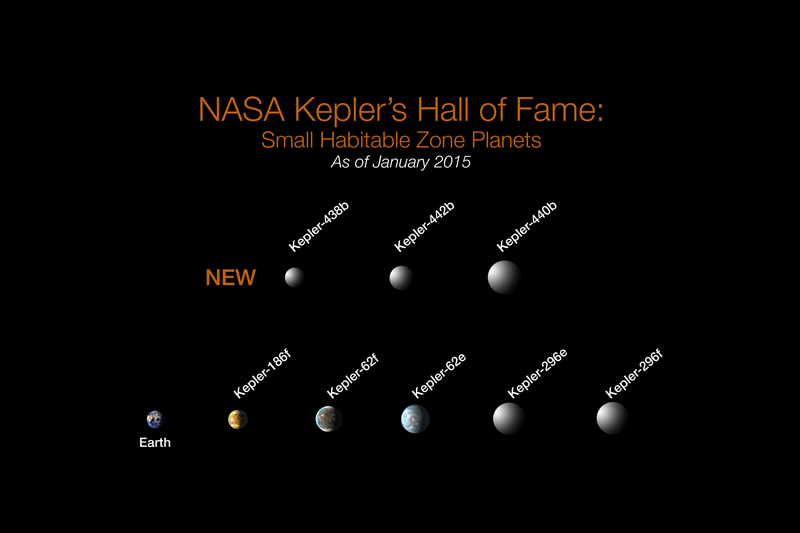 The planets are just the latest in a long series of exoplanets found by Kepler. Since its 2009 launch, the planet-hunting spacecraft has found 1,004 confirmed planets along with 4,175 planet candidates. Kepler-438b is located 70 light-years from Earth and orbits its star every 35 days. The CfA astronomers say its diameter is 12 percent bigger than Earth's. They estimate it has a 70 percent chance of being a rocky (rather than gaseous) planet, and believe it gets about 40 percent more light than Earth. Its chance of being in the Goldilocks zone is about 70 percent. Kepler-442b, 1,100 light-years away, is roughly one-third larger than Earth and has a 112-day year. Astronomers estimate it gets about two-thirds as much light as Earth and has a 60 percent chance of being rocky. Its chance of being in the habitable zone is pegged at a whopping 97 percent. "Each result from the planet-hunting Kepler mission's treasure trove of data takes us another step closer to answering the question of whether we are alone in the universe," John Grunsfeld, associate administrator of NASA’s Science Mission Directorate at the agency’s headquarters in Washington, said in a written statement issued by NASA. The findings were announced Jan. 6 in Seattle at a meeting of the American Astronomical Society. A paper describing the discoveries has been accepted for publication in The Astrophysical Journal.